Hello, lovely SF/F/H fans wherever you may be ! This is your friendly neighborhood Darrell Awards Jury Chairman, reminding you that we will CLOSE nominations for the 2019 Darrell Awards tomorrow – Saturday, December 1, 2018. This means that all your lovely, amazeball, splendiferous, and otherwise-eligible works that have not yet been nominated — well, you need to get that done before the end of Saturday. Once we we hit midnight here in Memphis on Saturday, that’s it. We will be closed for any further nominations. Oh, did I mention that we accept nominations in novel, novella, short story, other media, and Hall of Fame categories? As always, read the Rules first before nominating. We made that easy – they are right there on the Nomination Form (pages 2 and 3 of the Form and you do NOT have to send that part back). Basically, if the story is Science Fiction, Fantasy, or Horror and it is not poetry and it was written by an author who lived in this area when it was published OR contains at least one significant scene set in this area, go ahead and nominate it. Really ! The 2019 Darrell Awards Nominations Form is available in a selection of formats just to make it easy for anyone to nominate. So, what are you waiting for? Get those nominations in NOW before it is too late. Your choice of the Best Midsouth SF/F/H can not win unless it is nominated before the deadline. The 2018 Darrell Awards Jury is very pleased to announce the following results of our deliberations. So, there you have — the Honored Works and Authors of 2018. Go ! Buy their books and read their stories ! The 2018 Darrell Awards Jury held its final meeting tonight and we are pleased to announce the following Finalists. 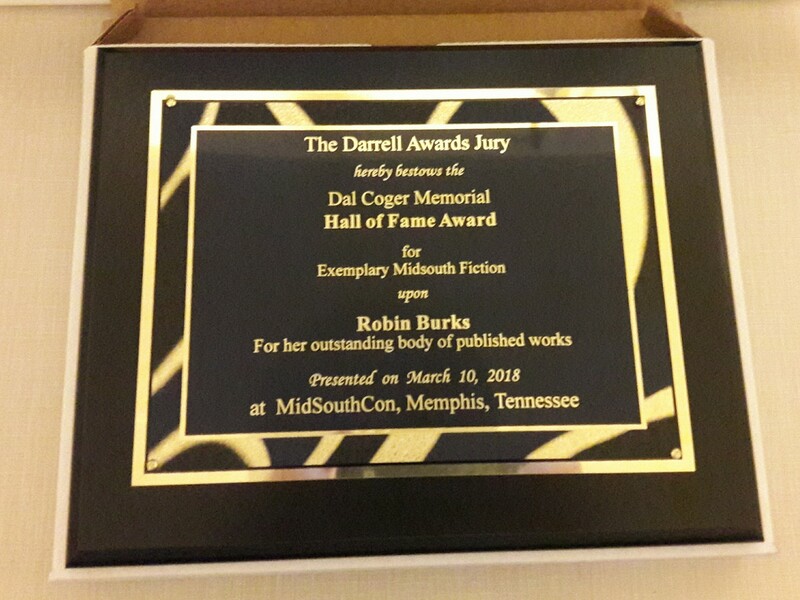 In addition to these Finalists, the Jury also announced that Robin Burks is our 2018 inductee to the Coger Hall of Fame for her three novel series (Zeus, Inc.; The Curse of Hekate; and Return of the Titans). Please join us at MidSouthCon on Saturday March 10, 2018, for the Awards Banquet at which we will present the Winners and First Runners Up.